The next round of the HUB begins April 9th from 9-11am and will have 6 sessions that meet weekly and require constant attendance (please take this into consideration before you sign up as space is limited.) Sign up is required. Email info@revolvechurchnj.com for more information and to sign up. 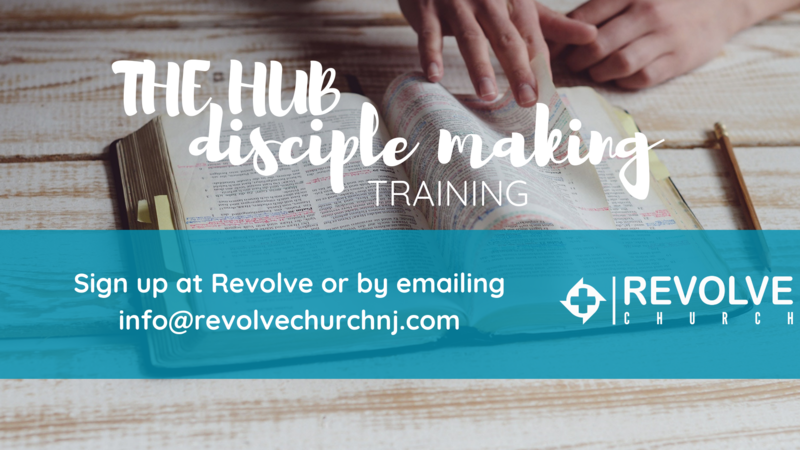 At the Hub, our disciple-making training, you will receive practical tools, including the Discovery Bible Study (DBS) method, to help you prayerfully work towards making disciples in your community. Through the DBS method, you'll learn how to discover God's truth from God's Word, obeying and applying it to daily life. You'll also learn how to read the Bible with God- seeking friends and family, teaching them to discover God for themselves rather than relying on you to TELL them about God. Join us in learning how to live your faith out loud as "missionaries" where we live, work, learn and play.